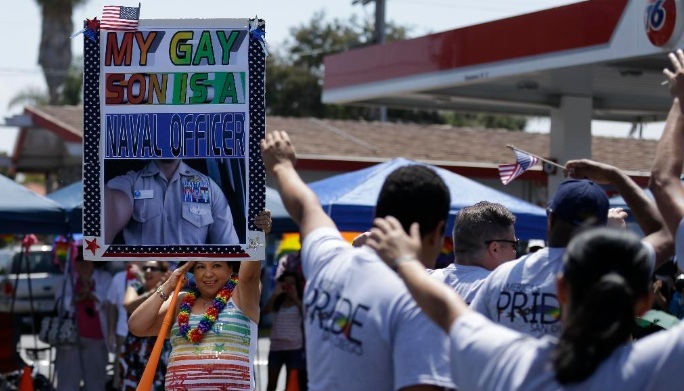 Active-duty troops marching in military uniform got the loudest cheers at San Diego's gay pride parade. This is the first time that U.S. service members participated in such an event while in full uniform. Dozens of soldiers, sailors, and Marines marched alongside an old Army truck decorated with a "Freedom to Serve" banner and a rainbow flag. They were joined by dozens more military personnel in civilian clothes, but the uniforms stood out among the flower-bedecked floats and scantily clad revelers. Spectators waved signs reading, "Thank you for your service." A woman held a placard that said: "My gay son is a Naval officer." "Today is so important," said Navy Lt. Brian McKinney, who marched with his civilian partner, Hunter Hammonds. "It's about putting on my uniform and taking pride in my service, my fellow service-members, my family and myself. It's something I'm incredibly thankful for." 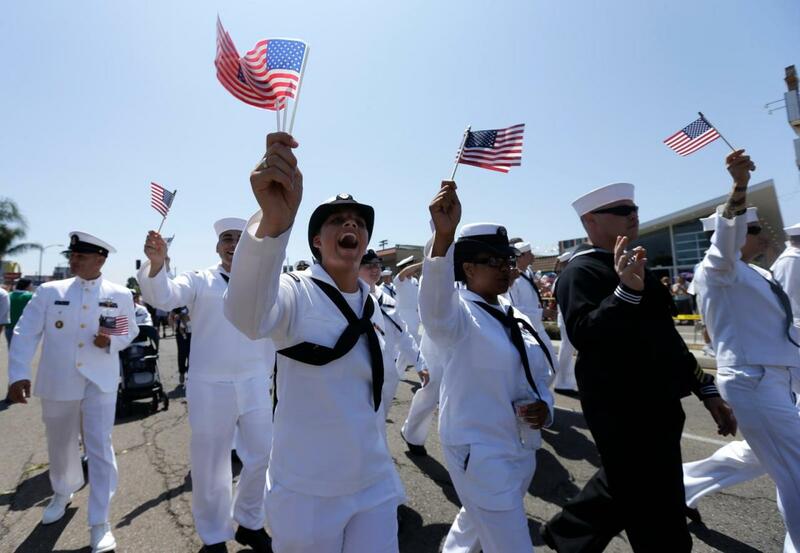 In a memorandum sent to all its branches this year, the Defense Department said it was making the allowance for the San Diego event even though its policy generally bars troops from marching in uniform in parades. 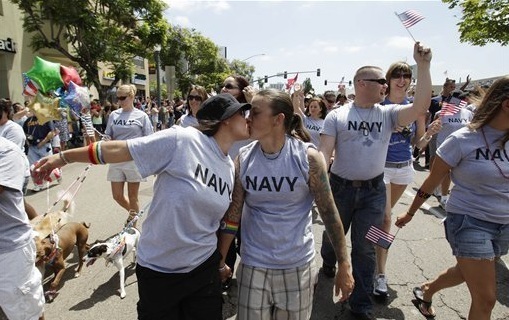 The Defense Department said Thursday it did so because organizers had encouraged military personnel to march in their uniform and the parade was getting national attention. Cmdr. Kent Blade, who will retire this fall after 26 years in the Navy, said being able to march in uniform was a perfect culmination of his career. The 47-year-old said that since last year's repeal of the "don't ask, don't tell" law, he has received unconditional support from his fellow officers. "We've all been able to talk more freely about our lives. Nobody's leading a second life," he said. "And now that I can march freely in uniform, I think it's a great display for the Navy." About 200 active-duty troops participated in last year's San Diego gay pride parade, but they wore T-shirts with their branch's name, not military dress. Photos from Associated Press/Gregory Bull.